What makes The Perfect Burger? 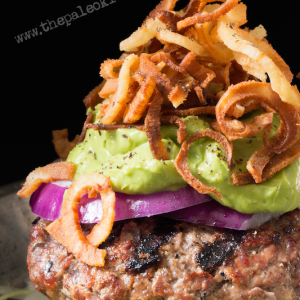 Check out this recipe to get the low down on how to construct your own Perfect Burger! Paleo-friendly. Divide meat into 3 equal portions and form into ½-inch thick patties. Use your thumb to make an indentation in the center of each burger. Set aside. While the burgers are cooking, add the coconut oil to the saucepan. Test the oil by placing one parsnip shoestring in the oil to ensure the oil bubbles. Add the parsnips to the oil and cook for 1 to 2 minutes until golden brown. When the parsnips finish cooking, place them on a paper towel-lined plate to drain. To assemble the burgers, place each on a bed of lettuce and top with sliced red onions, ¼ cup avocado mousse, and parsnip fries.